In June 1967 Burnley signed Frank Casper from Rotherham United for a fee reported at £27,000. It was, in general football terms, nothing remarkable. It wasn't a ground breaking fee for English football but it was a transfer that stunned me. I'd been watching Burnley for seven seasons by then. I'd seen 45 different players in action for the club and no less than 43 of them hadn't previously played for another league club. The only two that had were Jimmy McIlroy and Alex Elder and they'd both played in the Irish League for Glentoran. Not once in those seven years had Burnley signed a player from another club; the last player to arrive in such a way was Elder who had arrived from Glentoran in January 1959, some eight and a half years earlier. It was exciting stuff and at the time I didn't know I'd seen him play at Turf Moor over three years earlier; that was in an FA Cup tie for Rotherham, the only club he played for besides Burnley, and he scored in a 1-1 draw before Burnley won the replay at Millmoor. The Barnsley born Casper had joined Rotherham from school where he'd been a successful player at county level and got as far as having trials for England. He came close to signing for Blackpool but opted to remain in Yorkshire. He was only 17 when he got a debut for the Millers against Derby and he went on to make over 100 league appearances for them before making the switch to Turf Moor. He'd scored 26 goals for them in those league games, a total that was to prove significant come the end of his career. The new man went straight into the first team for the opening game of the 1967/68 season against Coventry and scored in a 2-1 win. He scored in the next two games also and netted five times in his first five appearances, and that made him an instant crowd favourite with the Burnley fans. Casper was our leading goalscorer during his first two seasons at Burnley, comfortably reaching double figures on both occasions. Such was his form that he was selected to play for the Football League against the Scottish League at Hampden Park during the 1968/69 season. He scored in that game too. A quieter season for goals followed and his fourth season at Burnley proved to be a big disappointment for club and player. He suffered with injury and was in and out of the side. He played just half the games and scored only four times as we were relegated. Casper was to prove a vital member of the team over the next two years as we successfully got back to the first division. He formed a partnership with new striker Paul Fletcher and was an ever present in the second of those seasons when promotion was won. The 1972/73 season proved to be his best yet and there was a real belief that further representative honours couldn't be far away. Sadly, the 1973/74 season was one he'll always remember and for the wrong reasons. In just our fourth game of the season we beat Spurs 3-2 at White Hart Lane. Ray Hankin replaced Paul Fletcher that night but Casper was the star. I don't think I'd ever seen him play better. That was until the following Saturday at Molineux when he turned in an absolute master class of a performance against Wolves. He scored a superb goal too in a 2-0 win. Frank Casper was in his pomp. Surely nothing could stop him now and there was much talk of a call up for England. Then, just three days after that performance at Wolves the sorry side of football took over. In a return game against Spurs it is sad to say they targeted him. He'd tormented them a week earlier and they weren't going to let that happen again. I lost count of the number of times he was fouled in the short time he was on the pitch that night but the last one of them, by Cyril Knowles, saw him stretchered off and out of the game until February. Soon back into the swing of things, he scored at QPR and then got the only goal in the win over Wrexham that took us into the FA Cup semi-final against Newcastle. A week before that cup date at Hillsborough we just had the small matter of a league game at Elland Road against top of the league Leeds United. It was, in the main, a marvellous day as we tore them apart. We won 4-1, and their goal didn't go in, but that Leeds team didn't take defeat very well. I can still see it now as Norman Hunter clashed with him and left him laid out over the touchline. We hoped that the injury wasn't serious and that he wouldn't miss the semi-final. Such was his importance to the team that he played, but he probably shouldn't have done and it was another 18 months before we saw him in action again. It was a 'knee' injury so we all assumed cartilage. No one had heard of anterior cruciate ligament injuries then. Frank had his repaired and eventually returned for a home game against QPR. He'd scored 73 league goals for Burnley and added to the 26 for Rotherham he was just one short of the century. With just a few minutes remaining he scored from a free kick to give the Clarets a 1-0 win and got that one hundredth goal. There were to be no more goals and not many more appearances, and in January 1976 he decided to call it a day after a 3-1 defeat at Norwich. 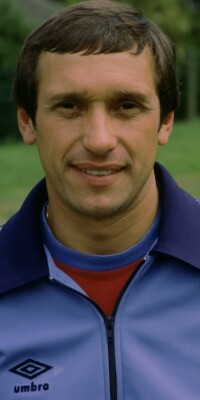 He immediately joined the coaching staff and became assistant manager in 1979 when Brian Miller replaced Harry Potts. It was Casper who took over from Miller in January 1983 until the end of the season. He had a spell as assistant manager at Bury, when Martin Dobson was in charge, and then returned to Burnley as manager, again replacing Miller, in January 1989. He held the job until resigning in October 1991 when he went into a sportswear business with the club's marketing manager Joyce Pickles. His association with Burnley was over, other than when his company provided the kit for a time either side of the Millennium. He was never able to achieve success as manager as he'd done as a player but he proved to be a superb signing for Burnley, and all for £27,000. Paul Fletcher once told me that the Burnley team was never quite the same again after Frank Casper got injured and that he himself was never quite the same player without Frank Casper alongside him. It's easy to say now but I'm sure, given the form he was in at the time, that an England call couldn't have been far away. It wasn't to be - Cyril Knowles and then Norman Hunter saw to that.